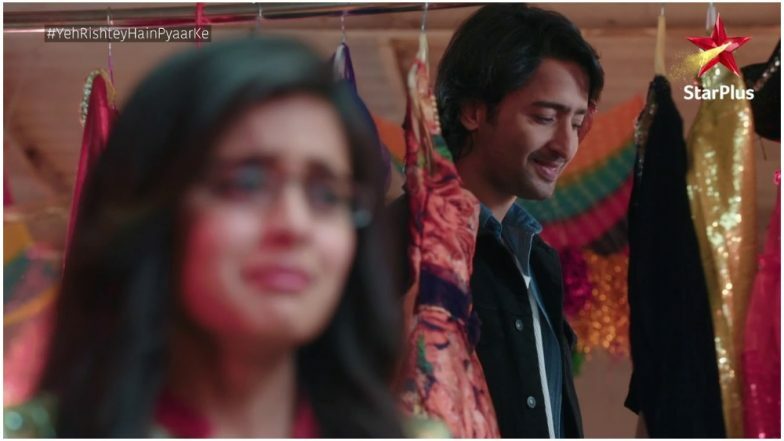 Today’s episode of Yeh Rishtey Hain Pyaar Ke starts with Abir (Shaheer Sheikh) telling Meenakshi that son however big they become they are child only in front of their mother, this is what she thinks. Seeing her tab in Abir’s hand she questions him how come he has it. Abir shows Kuhu’s photo and asks after seeing this she changed the proposal and then complaint the police. Meenakshi shouts at him, all come hearing them shout at each other. Kunal comes and tells Abir not to talk like this to Meenakshi. Abir tells everyone that this all was done by Meenakshi and that for controlling Kunal she can go to any extent and hurt anyone. Abir says that in this society if a boy does a mistake then people forget it but if a girl does or gets blame then the society never forgets such thinks and make their life hell. Kunal asks Meenakshi if she called the police, suddenly Parul says that she called the police and narrates a fake story. Abir does not believe her words and thinks she is trying to save Meenakshi. There Kuhu and Mishti (Rhea Sharma) tell sorry to Vishambar, he gives them each a gold bracelet. Vishambar says he gave this as he is proud of them as they did the good thing. Vishambar tells that no one will call the Rajvansh’s and that they will wait for their call. Meanwhile, Abir thinks about Mishti seeing her photo. There Mishti also thinks about what all happened there. Kunal sees Meenakshi sleeping and is tensed, seeing Dadaji he ask why he did not sleep till now. Kunal tells Dadaji why Abir and Meenakshi fight every day and what will they do to stop it. Abir comes and tells sorry for his behaviour. Kunal and Dadaji tell him to say sorry to Meenakshi. Next day as Meenakshi plays her veena, Abir comes and tells sorry to her. Meanwhile, Dadaji goes to the Maheshwari’s and folds his hands and tell sorry to them for whatever happened yesterday and invite them to come for Ketki’s mehendi. Vishambar tells that they will not able to come but Kunal comes and request them that they should forget everything and come home for mehendi. There Meenakshi is feeling proud as Abir came to say sorry and tells she did not feel bad. Abir gets emotional and tells that they fight with each other but they love also each other. Meenakshi tells Abir that whenever he feels he can fight with her but never leave her and go. Abir says he will never go. In the precap, Meenakshi tells Abir that he send Kunal to Mishti’s place, there Mishti tells dadaji about the courtship she wants to have before marriage.